CARL RUSSO/Staff photo. 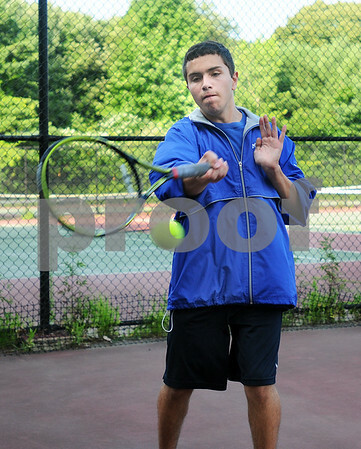 Joe Wakim practicing his tennis. Seventeen-year-old twins Mike and Joe Wakim are entering their senior years at Methuen High. They are top students, doubles partners in tennis for the Methuen Rangers, alto saxophone players for the Rangers marching band and black belts in karate. 7/31/2014.